Experts say to look for aggregate patterns to ensure a long-term success strategy. Michelle Laufman Monroe, patient financial services manager at Mountains Community Hospital in Lake Arrowhead, Calif., says she had grown accustomed to seeing an 8-inch pile of denials towering over her desk each week. In particular, the critical access hospital struggled with timely filing denials and an admission accuracy rate of less than 30%. When denials were at an all-time high, Monroe says Mountains Community Hospital didn’t have a concentrated effort to address the issue, which only perpetuated the problem. But today, it’s a different story. Not only has the hospital managed to gain control over its denials, but it has also implemented an enterprisewide strategy to ensure long-term success and improve its registration accuracy to nearly 85%. How did the hospital do it? By implementing a strong denials management strategy and holding relevant departments accountable for their role in the process, says Monroe, adding that the hospital still has a long way to go in terms of meeting its own performance goals. Mountains Community Hospital is one of countless providers nationwide struggling with denials management. Although denials can vary among hospitals in terms of volume and cost, roughly 12% to 15% of gross charges are initially rejected by payers, says Karen Bowden, RHIA, president of consulting services at ClaimTrust. In today’s economy, rising denials are something that hospitals must address, says Neville Zar, senior manager in the healthcare providers practice at Deloitte Consulting LLP in Boston. “It’s one of the most important issues facing hospitals, and it’s becoming even more important with the margin pressures that providers are facing,” he says. The biggest mistake hospitals make when trying to manage denials is to correct individual claims rather than looking for aggregate patterns or trends across different general categories, says Bowden. With more than 250 remittance codes that denote certain types of denials, it should come as no surprise that categorizing them is no easy task. 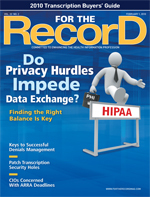 Although HIPAA specifies certain standard codes, some payers continue to operate under their own individual guidelines. For example, for most payers, code C050 denotes the lack of medical necessity; however, Blue Cross uses code PR96 (noncovered service) for this purpose. The tools to which Bowden refers are software solutions that integrate with a hospital’s billing system. Experts agree that although technology isn’t the only solution, it’s certainly a major piece of the puzzle because it automates workflow and creates enterprisewide accountability. However, not being able to afford a software solution shouldn’t preclude hospitals from devising a manual strategy of their own, she adds. Categorizing the types of denials coming in the door is perhaps the most labor-intensive part of denials management, but it also reaps the most rewards, says Christine Armstrong, principal with Deloitte Consulting LLP in Los Angeles. “Identifying denial type is important. If you don’t have good ability to track your denials, categorize them in a way that allows you to trend, and then feed that information upstream, then you’re in a perpetual circle of correcting, fixing, and resubmitting bills from the back end,” she explains. The following is a discussion of the top seven types of denials and tips on how to ensure your hospital doesn’t fall prey to their powers. Medical necessity denials win the prize for highest volume, says Bowden. Although these denials range in type, they have one aspect in common: The cost can potentially be exponential. Consider an inexpensive lab test that a hospital may perform as often as 150,000 times per year. If a lack of medical necessity commonly occurs with these tests, it could end up costing the provider substantial money. Examples of such tests are those for prothrombin time, partial thromboplastin time, and glucose. Bowden says performing a root-cause analysis can be helpful. For example, an analysis may reveal that physicians in the emergency department commonly order tests as panels when patients may need only one or two individual tests. “Talk to physicians to explain that they may not need all of the tests in the panel. It’s about educating them that there are a lot of denials that are occurring and there’s additional expense that the hospital is incurring for doing the test when it isn’t necessary,” she says. Then there are the high-cost radiology procedures, such as CT scans, MR angiography, and MRIs. Hospitals could be missing out on at least $500 per test when the diagnosis that meets medical necessity isn’t on the claim, says Bowden. A root-cause analysis could also reveal that a noncoding professional who doesn’t understand medical necessity requirements is simply coding these tests based on an encounter form that may or may not include a correct diagnosis, she says. “We’ve seen a lot of hospitals change their workflow for high-cost radiology and interventional radiology to flow coding of these procedures through medical records,” she adds. These denials occur when a provider bills a payer that is no longer responsible for paying a patient’s bill. A root-cause analysis may reveal that patient access isn’t performing a thorough eligibility assessment or verification, says Bowden. For example, registrars may simply ask “Has your insurance or employer changed?” rather than “What insurance do you have, and who is your employer?” The former typically solicits a “no” response from the patient even though the information in the hospital’s system may be outdated, she says. The latter is an open-ended question that encourages patients to articulate their employer and produce their insurance card for verification. Some providers have found that implementing outbound call centers can help combat this issue, says Zar. In these centers, registrars call patients at least 48 hours before scheduled services to verify demographic and insurance information. Although most hospitals use electronic tools that check insurance eligibility at various points during a patient stay, many fall behind in working the reports that include patients who don’t qualify for services, says Bowden. “Somebody has to work the ones that fail. A lot of administrators think they’re covered if you buy these tools and systems, but if you don’t work the negative responses, it all falls apart,” she says. The best practice is to run these reports at the point of scheduling, three days before any elective visit, and again on the date of service. If a patient comes in emergently, run the report at the point of service, Bowden recommends. Unscheduled procedures—especially those performed in the emergency department—pose a particular challenge because a patient’s welfare is given priority over a thorough registration or insurance verification. Providers should try to contact patients who underwent unscheduled procedures within 24 hours of their visit, says Zar. “Some providers wait until they get the denial and then contact the patient. Patients don’t call back for something that happened four months ago,” he says. These denials occur when payers simply don’t cover the services rendered as outlined in their payer-specific handbooks or contracts. For example, Medicare does not pay for routine annual physicals. When a provider performs a routine annual physical for a Medicare patient, the patient should sign an advance beneficiary notice. The same goes for routine dental and podiatry services for Medicare patients. Denials for invalid codes typically occur in January when new CPT codes take effect, says Bowden. They can also occur periodically when Medicare issues new CPT or HCPCS codes and makes others invalid. These denials can usually be fixed relatively quickly and with minimal analysis by simply monitoring remittance advice codes for the error and then updating the chargemaster accordingly, she adds. Modifier-related denials frequently occur with modifier -25 (significant, separately identifiable evaluation and management [E/M] service by the same physician on the same day of the procedure or other service) and modifier -59 (distinct procedural service), says Bowden. The key to combating the issue is monitoring remittance advice codes for each modifier and then performing a root-cause analysis and training as needed. For example, if an analysis shows that a staff member is incorrectly appending modifier -25 to a non-E/M code, offer additional education to that employee. These denials occur when a payer requests additional documentation (eg, operative reports, discharge summaries, or lab results) prior to paying a claim and the provider fails to submit that documentation in a timely manner or at all, says Bowden. Getting to know each payer’s requirements can help, says Armstrong. “If there is a payer that requires a copy of the report every time you have a certain procedure and you know that up front, then you implement processes that automatically allow that information to be submitted with the claim,” she says. Providers can also request that the information be outlined in their payer contracts, says Armstrong. This information can then be added to a matrix that staff members can use as a reference to determine when additional records are needed for certain diagnoses, procedures, or dollar thresholds, she adds. Zar says one of his clients knows that a certain payer always requests medical records for inpatient claims that include more than $40,000 worth of charges. This approach is more proactive and helps ensure timelier processing, he says. Look specifically at additional documentation request files that clearly outline additional requirements, says Bowden, adding that these files are separately attached to remittance advice codes and can be a wealth of information. All non-Medicare payers require authorization for inpatient services, says Bowden. On the outpatient side, authorizations are required for specific services, depending on the particular insurer. When the authorization number is not included on the claim, a denial occurs. Sometimes, payers authorize only observation rather than an inpatient stay, she says. This can lead to a denial when the patient is subsequently admitted to the hospital. Although centralized referral centers can help combat the problem, many providers continue to struggle with obtaining referrals and authorizations. Looking at aggregate data to determine in which department a lack of referrals typically causes denials is a start, Bowden says. Also look at whether denials occur for certain types of procedures (emergent or elective) or certain payers. Aside from tracking aggregate data, hospitalwide accountability is a key factor in denial management success stories, says Debra Halvorson, senior chargemaster consultant for Wipfli LLP, who helped Mountains Community Hospital implement an effective plan of attack in less than one year. Halvorson says critical access hospitals such as Mountains Community Hospital have a particular advantage because unlike their larger acute care counterparts, staff members in a critical access hospital tend not to work in silos. “They are very aware of how their work affects their neighbors,” she says. Larger hospitals can achieve this same dynamic by establishing a denials management committee to enhance enterprisewide dialogue, says Halvorson. At a minimum, the committee should meet weekly and include the chargemaster coordinator, billing manager, registration/admitting manager, HIM director, and coding manager, as well as representatives from patient financial services and case management. “Teaching your denials management committee which member is responsible for the denial adjudication is absolutely paramount,” says Halvorson. “Distribute denials to these people who can take them back to the source and correct them at that level.” For example, medical necessity denials should go to case management. Duplicate bills should be handled by the billing office. Incorrect or missing modifiers should be addressed by HIM. Insurance eligibility denials should be handled by registration. When determining how to approach denials management, providers should use the information that’s already given to them throughout the claims submission process, says Zar. For example, the 835 transaction set that refers to the incoming standard transaction from the payer includes a plethora of information about the root cause of the denial, he says. Using data analytics, providers can compare this information with data in their own patient management or patient accounting systems to determine the denial’s various other details such as the date of service, payer, plan level, physician, or staff member who handled the account. Zar says one of his clients uses information gleaned from the 835 transaction set to analyze patient access denials on a monthly basis. The client determines which staff members register particular patients whose claims were denied due to reasons such as unidentified patient or incorrect patient identification number and then provides retraining for those individuals. Another source of information is the clearinghouse, which oftentimes provides a daily file with predenials that providers can use to correct their mistakes before submitting the claim to the payer, says Zar. “Most hospitals are looking at [predenial information] and integrating it into the process. In my opinion, providers are doing a better job of working with the clearinghouses than the payers,” he says. However, providers must ensure that claims don’t sit in a claim scrubber or clearinghouse for an extended period of time because this could lead to a timely filing denial, says Zar. “This is one of the most painful denials for a CFO [chief financial officer] to see because they got everything right but just didn’t submit it on time. Every provider has probably a couple hundred thousand to a million dollars per year in the category of denial for timely filing,” he says.